JANUARY 2009 -- With the start of a new Grange year, your State Grange Information/Publicity committee met to make its plans for the coming year. We will try to assist as many of the Subordinate and Pomona Granges in getting their newsworthy articles into the local newspapers as possible. We will need your assistance in getting this done. Your State Committee has compiled an address list of Information/Publicity Chairmen in all of the Subordinate and Pomona Granges. We will be using this listing to mail a quarterly newsletter to each of the Granges. These newsletters will contain helpful hints and recommendations for you to use. During our meeting, two simple suggestions were made to get the Grange=s name before the general public. The first was placing a copy of the Connecticut Granger in your local library. This simple suggestion would only cost your Grange $3.00 per year. 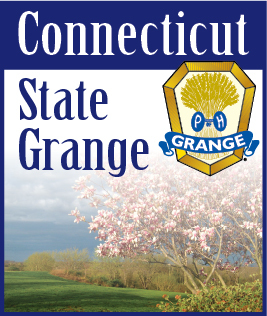 The second suggestion is to purchase a Grange Marker sign from National Grange. I believe the cost is $25.00. For an additional $5.00 they will furnish a small sign with your Grange’s Name, Address and when you meet. The Lions, Rotary, Kiwanis and other organizations have similar signs that can be found on the roads leading into your town. The idea is to keep the name of your Grange before the public’s eyes.